Platelet rich plasma injection is a new treatment for tennis elbow and golfer’s elbow which can be performed in the outpatient clinic. Platelets are small blood components which are responsible for initiating clotting and healing when you injure yourself. A PRP injection therefore aims to harness your body’s own healing mechanisms to treat a chronically injured tendon. This is in marked contrast to traditional steroid (cortisone) injections which can reduce pain for a short period of time (typically 4 to 6 weeks), but do not treat the underlying problem. 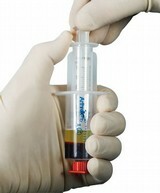 PRP injection takes about 20 to 30 minutes. First some local anaesthetic is injected around the tendon to numb the area. Next a blood sample is taken and then spun in a centrifuge to separate your blood’s components and increase the concentration of platelets in the plasma. This platelet rich plasma is then drawn off and injected into the damaged tendon, activating the platelets and triggering the healing process. The injection site can be painful when the local anaesthetic wears off. This is because the PRP stimulates an inflammatory reaction. This should be treated with simple pain-killers such as paracetamol or cocodamol but not non-steroidal anti-inflammatory painkillers (such as ibuprofen) as these may reduce the effectiveness of the platelets. It can take 6 to 8 weeks to start to see an improvement, and several more months for maximal effect. This is because PRP works by stimulating a gradual healing process. The PRP injection can be repeated, but this is not usually necessary.